‘At Night A Song Is With Me: A Cycle of Ballads and Psalms for Singers, Rhythm Section and Orchestra,’ was composed, produced and directed by world-renowned musician Rob Mathes to lyrics by Micheal O’Siadhail. 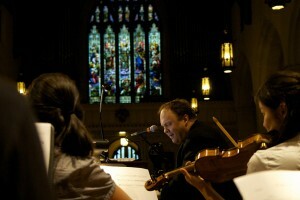 The response to the premeir performance in Spring of 2010 was so overwhelming that in the Autumn of that same year, Mathes performed the concert again in his home town of Greenwich, Connecticut, this time filming the event in high definition. “This concert is an unbelievably rich evening of lyrical music and song, thanks to the work of these incredible artists and Micheal’s words, which are extraordinary; not to mention the Psalms, some of the most beautiful poetry ever written,” noted Mathes. O’Siadhail and Mathes wrote the song cycle to trace a life through the Psalms.